This tutorial introduced participants to the transparency requirements of the General Data Protection Regulation (GDPR) . Therein, it was explored together with the attendees whether technical specifications can be valuable to support transparency in favour of a data subject whose personal information is being processed. 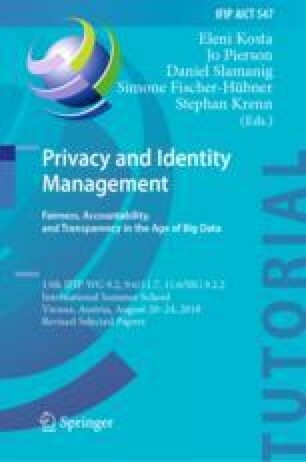 In the context of the discussions, past and present international efforts were examined that focus on data privacy vocabularies and taxonomies as basis work to enable effective enforcement of data handling policies. One example of a current undertaking in this area is the W3C Data Privacy Vocabularies and Controls Community Group (DPVCG) which aims at developing a taxonomy of privacy terms aligned to the GDPR, which encompasses personal data categories, processing purposes, events of disclosures, consent, and processing operations. During the tutorial session, the potential of such efforts was discussed among the participants, allowing for conclusions about the need to re-align and update past research in this area to the General Data Protection Regulation. Supported by the European Union’s Horizon 2020 research and innovation programme under grant 731601.